EndTime Issues ... : An "Abominator" - The "Abomination"
The Jerusalem temple was renowned for its beauty and known throughout the Roman Empire. It was still under construction during Christ’s first year of ministry – the 45th year of its building. Christ stated that it would be destroyed within a generation (Matthew 24:2), a disconcerting thought to the disciples. 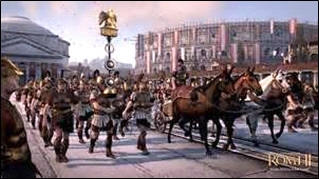 History affirms that desolation did occur in 70 A.D., with the pillaging Roman armies of General Titus – forty years after Christ’s announcement. That invasion, the annihilation of the temple and the escape of God’s true believers, became an eschatological metaphor for the greater purpose of the Olivet discourse, portraying earth’s last conflicts. Those “abomination” and “desolation” issues are addressed within the context of Daniel 8 through 12. There, an accelerated end-time focus occurs. “And from the time that the daily [sacrifice] shall be taken away, and the abomination that maketh desolate set up [a judicial standard], there shall be a thousand two hundred and ninety days” (Daniel 12:11 – NIV). Jesus revealed that this “abomination” would come at a time when chaos and turmoil would rule within society. Intriguingly, Pope Francis recognized such an hour had come when he noted in January, 2015, in his Sri Lankan visit: “The Gospel is the promise of God’s grace, which alone can bring wholeness and healing to our broken world. It can inspire the building of a truly just and redeemed social order.” This later phrase unmasks Rome’s geopolitical ambitions to restructure society for the “common good” (now under way). That interest goes beyond the gospel of God’s grace and requires centralization of its power to bring peace. Jesus said: “And then shall many be offended, and shall betray one another, and shall hate one another” (Matthew 24:10). Might some “redeeming gesture,” addressing such hatred for the “common good,” actually be an abomination in God’s eyes? Stay tuned. Intriguingly, prophecy notes that the abomination is then followed by a “great tribulation” (known by many expositors as “Jacob’s Trouble”). The time of the end is in focus. What man tries doesn’t work. Even Daniel (with Christ at his side) warned of this treacherous time (Daniel 12:1, 7). That harlot, seen by John, is the “abominator”! Her cup is full of “abominations” of her fornication (Revelation 17:4). In Luke’s rendition of the Olivet discourse, he avoids the word “abomination” and focuses on its consequence – desolation. He does introduce a special clue as to “what” causes that devastation. “And when ye shall see Jerusalem compassed with armies, then know that the desolation thereof is nigh” (Luke 21:20). Jesus said: “When ye see” – the armies encompassing Jerusalem – “depart” – “get out of there.” Desolation is near. Though Luke’s rendition appears to focus most on the prophecy’s literal fulfillment, the events are filled with rich metaphors for a greater end-time spiritual understanding. “Jerusalem” is there a symbol for God’s church in apostasy (Matthew 23:37-38), with the implication that a remnant will “come out” and be safe. The Roman armies are represented as the ones bringing some form of detestable, idolatrous pollution into the church, which God sees as an illicit gesture. Who would then be seen as representing the Roman armies at the end of time? What Roman force would bring a pagan standard into the Christian church, leading to its fall? Moving forward in our search, Mark is descriptive and helps to focus more deeply on the greater spiritual purpose of end-time prophecy and these answers. “But when ye shall see the abomination of desolation, spoken of by Daniel the prophet, standing where it ought not, (let him that readeth understand,) then let them that be in Judaea flee to the mountains” (Mark 13:14). The abomination is an observable “sign” – in fact, so dramatic that it must bring a rapid “moment’s notice” response! It comes at a point in time – “when” you will see. The armies spoken of by Luke that bring desolation are now a metaphor to facilitate that “abomination.” They will come by force, like military might, into the Christian church. The desolation (eremosis – G) is God’s judicial act, a direct reaction to that abominable act. The issue, Mark notes, is detailed in the book of Daniel, where it suggests that it comes as a law – a forced act. In Luke the armies (“abomination”) would surround Jerusalem – God’s people. Here, they are depicted as something which actually comes into the church and takes an established position. Those “events” can be seen/perceived and requires God’s people to get away from its influence. Both Matthew and Mark note specifically that these things can be understood. We can anticipate special sensitivity when our own spiritual experience is growing. “The secret of the LORD is with them that fear him; and he will show them his covenant” (Psalm 25:14). Matthew once again affirms that the abomination is a sign that must be distinctly identified. This word describes God’s reaction to some sin that is intruding into the Christian world. It is often explained as something “detestable” to Him. God’s true people will all recognize when it arrives and what it is. It will surround and then invade the Christian church. It comes directly into the “holy place” (24:15), again suggesting that it becomes a controlling force within the Christian world. The imperative to “flee” is to distance oneself from its influence and possible impact. The setting is the church, and commensurate with Jesus’ original announcement that the temple would be destroyed (Matthew 24:2), this abomination will ultimately bring desolation to the church! God’s people will not be part of it then! Before looking further at Daniel, a fascinating warning is found in Paul’s second Thessalonian letter. He is reorienting those members against a deception regarding Christ’s coming (parousia) that they mistakenly believed was pending. There he calls His return “the day of Christ” (I Thessalonians 2:1-2; cf. “day of Lord” in I Thessalonians 5:2). What follows ties directly to Christ’s Olivet discourse. Before the Second Coming occurs a “man of sin,” who is the “abominator,” will be unmasked. He enters the temple just as the abomination does. As Matthew and Mark have already shown, this horror to the Christian world will be understood. Here, the “abominator” will also be revealed. He will be part of some religious apostasy or rebellion! The “falling away” assumes that some “healthy” relationship had existed with God previously. There, then, occurs a departure from that faith. This problem occurs within the church. An antichrist or “man of sin” (lawless one) appears and is recognized as part of this apostasy before Christ comes! The coming of this “man” is seen by scholars as instigating the apostasy (Daniel 11:29-34, 12:10-11). This relates, intriguingly, to the abomination in Daniel that leads to desolation! This “abominator” is so significant that Paul calls him the “son of perdition” – a man doomed to destruction (apoleia – G). Paul notes that he exalts himself above every God or object of worship and proclaims himself as God. He sits in the temple of God. He occupies a leadership role in the church and brings in corruption. He forsakes the holy covenant (vs 32). He will persecute the covenant community (vs 33). And – he sets up the “abomination” that makes desolation (vs 31), which Mark and Matthew say enters the church! There appears to be a massive “falling away” within the global Christian church. This paves the way for an abominator to set himself up over everyone and then introduce this abomination! Sitting in the temple is not a literal reference to Israel and some restored structure. It is symbolic of ruling over or controlling an apostate church. Jesus referred to Himself as a temple (Matthew 26:62). Paul notes that the believers are to be part of the temple of God (I Corinthians 3:16-17, II Corinthians 6:16, Ephesians 2:19-21, I Peter 2:4-7). He is trying to take the place of God within the body of “believers”! He changes God’s laws or times (Daniel 7:25, 8:11-12, 11:30-32). Daniel 12 is the concluding chapter of his book. It includes a fascinating discussion between Christ and Daniel – a “time of the end” (es qes – H) discourse (vss 4, 9). Again: “And from the time that the daily [sacrifice] shall be taken away, and the abomination that maketh desolate set up, there shall be a thousand two hundred and ninety days” (Daniel 12:11). When the word “day” (yom – H) is used in Biblical Hebrew with a number (ordinal or cardinal), it refers to a literal 24-hour period. The 1290 days are no exception. They link perfectly with the 1335 days (vs 12) and the solar years noted as “time times half” (vs 7). The abomination that causes desolation is the onset of a 1290-day period. The imagery of this chapter reveals two ends: (1) The termination of the prophecy of the previous chapter (12:1-3), with the deliverance of God’s people and a special resurrection (Daniel 12:1-2) and (2) Timed prophecy of the “time of the end” (Daniel 12:4, 9; cf. Daniel 8:17, 19), relating to Matthew 24 and II Thessalonians 2! The “vile person” or “king of the north” (cf. Daniel 8:23 = “little horn” called a king) opposes God’s covenant (Daniel 11:30), pollutes God’s church (Daniel 11:31), contextually by taking away the daily and placing (setting up) an abomination. This is also associated, as we have seen, with the “time of the end,” called the “appointed time” (Daniel 11:35; cf. 8:17, 19). Daniel is filled with other details, clearly showing that that king, little horn, vile person and king of the north are all the antichrist. “And an host was given him against the daily [sacrifice] by reason of transgression, and it cast down the truth to the ground; and it practiced, and prospered. Then I heard one saint speaking, and another saint said unto that certain saint which spake, How long shall be the vision concerning the daily [sacrifice], and the transgression of desolation, to give both the sanctuary and the host to be trodden under foot?” (Daniel 8:12-13). Contextually, the transgression is what takes away the daily and is later the abomination. “Pesa” defines a breach of the relationship between man and God. It is rebellion against God’s law, covenant and authority. This relates to a rebellion against the Sabbath. That is found in God’s law (Exodus 20:8-11). It is part of God’s covenant relationship between Himself and mankind (Exodus 31:16). It reflects His supreme authority as Creator (Exodus 20:11, 31:17). The wording in Daniel 12:11 from the Septuagint is “When the abomination of desolation shall be set up” (LXE) with a concomitant “daily” being “taken away.” This strongly suggests a legal action or mandate is in force. A judicial act is implied since it is active for 1290 days. The previous chapter (vss 31-45) mentions north, south and east (11:40, 44). The context is within an “everlasting” framework (12:2). Thus, the “abomination” is appears to be a sin against the Sabbath by a power that affects mankind in earth’s final period of time. Roman Emperor worship began in 29 B.C. in Ephesus when a temple was built to deify Julius Caesar. It became an empire-wide phenomenon under Augustus Caesar. By the time of Caligula (37 A.D.) it was mandated through morning and evening sacrifices to him. Most Jews complied. That “abomination” became civil law. At the end of time a “beast” will be adored and worshiped by the world (Revelation 13:3, 4). A parallel “harlot” from Rome will enamor the world leaders so much they will drink of her wine noted as abominations. This gesture God identifies as fornication (Revelation 17:1-10). Christian apostasy is in view. As resistance by honorable Jewish leaders against all pagan worship began to accelerate in 66 A.D. in the port city of Caesarea, then spreading to Jerusalem 60 miles eastward, there will be a growing body of Biblically loyal believers who resist the growing inroads into the Christian church to accept those abominations, which prophecy clearly identifies as a sin against the seventh-day Sabbath. As from history, persecution will follow. Gessius Florus, Roman procurator of Judea, lashed out against the Jews (whom he hated) and invaded the temple, confiscating seventeen talents of silver from its treasury. This show of force was planned to humiliate and subjugate God’s loyalists. It failed. There will be those who discredit God’s people and His Word, noted in many prophetic missives, e.g., Revelation 12:15, as the end approaches. This, too, will fail (Revelation 12:11). There is a growing number of “events” that suggest that a Cestius-like campaign has begun its march around “Jerusalem” – God’s church. Simple examples: Pope John Paul II in 1998 urged that global State and Civil authorities guarantee that Sunday becomes a “holy rest” day. Pope Benedict XVI did the same in 2005 and then in 2009. An “army” is encircling. It will soon invade. As Vespasian’s armies, after massacring many in Galilee, moved toward Judea and their prize, Jerusalem, the death of Nero reached General Vespasian, delaying the campaign. This gave those who believed Christ’s prophecy reprieve to “flee.” They found a haven in the country of Perea in the area of Pella, across the Jordon. This served to separate those who were in apostasy from God’s true people. Leave larger cities (there is no isolationist or self-sustaining message in those writings as long as the work is not finished)! b. Fleeing the precincts of Babylon and its influences is distinct for: (1) Those who begin the Loud Cry and (2) Those called out of Babylon (Revelation 10, 11, 14 and 18). c. No specific preparation is to be made (like storing food, gasoline or toiletries). The prophetic context suggests that the last year before “deliverance” will be like a Jewish Sabbatical year when we are totally dependent on God. It will be then (not earlier) that we won’t be able to buy or sell as noted in Revelation 13). d. Have a knowledge base of what you will teach and defend – it is very specific. Who will be the “abominator,” the one who moves these things forward? From history and contemporary events, it can be conclusively shown that it is a Roman Church “power.” This focus is being discussed by an increasing number of Protestant Christians. Tom Horn and his associates and Jan Markell of Olive Tree Ministries are two influential contemporary examples. Of great importance is the very detailed prophecy in Revelation 17. It is clear that the center of the “harlot” apostate church is not only Rome but it becomes part of a great coalition seen as ten horns on the beast. This is unveiled further in Revelation 13. The “abominator” will be the papacy that the world wonders after. Antitypical parallels from history are unfolding now, especially with the maturing geopolitical coalition. It is vital that God’s people not only know the historical imprints of prophecy but their meanings today! In fact – unless the latter is perceived, the greater purpose of prophecy will be lost. We are “on the verge” of major global changes. The terror and alarm, as an example, that the Middle East generates is all part of creating “region seven,” one of those ten horns. Study – know – it’s all in the Bible and just before us. So many sermons, so much teaching, so many empty claims: “I know that Jesus is coming soon!” Do you know why things are different now from even twenty years ago? A “redeemed social order” is pending. It will not be driven by truth. Keener, Craig S.; A Commentary on the Gospel of Matthew (William B. Eerdmans Publishing Company; Grand Rapids, MI), p. 559 (cf. Jos. War 5.267; 2 Macc. 2:22). Tenney, Merrill C.; Pictoral Encyclopedia of the Bible (Zondervan; Grand Rapids, MI), vol. 5, p. 653, 1937. White, Ellen G.; The Desire of Ages, p. 630. Josephus, Titus Flavius; Josephus Wars 6.396. Eusebius, The Essential Eusebius, Luibheid, Colm, New York, Mentor-Omega Books, 1966, p. 97, III, 5:1-7 (as quoted in: http://www.oocities.org/nashville/opry/2092/Destruct.html). Fowler, Franklin S., Jr., M.D. ; The Last Geopolitical “Order,” pp. 50-52, 55, Appendix III (Christian Heritage Foundation, 2014). Were, Louis F.; The Certainty of the Third Angel’s Message (LMN Publishing International Inc.; St. Maries, ID; 1999), pp. 31, 33-37. Beale, G. K.; The New International Greek Testament Commentary; The Book of Revelation (William B. Eerdmans Publishing Company, Grand Rapids, Michigan – 1999), pp. 568-570. Josephus, Flavius, The Jewish War (37-100 A.D.), 6:396. White, Ellen G.; Thoughts from the Mount of Blessing, p. 127. Hagner, Donald A.; Word Biblical Commentary (Nelson Reference & Electronic, Division of Thomas Nelson Publishers), vol. 33B, p. 700. Nolland, John; The New International Greek Testament Commentary (William B. Eerdmans Publishing Company; Grand Rapids, MI), p. 969. Beale, op. cit., p. 203 (Thessalonians), p. 204 (Daniel 8, 11). Cassuto, Umberto; Genesis I (1961), p. 29, as quoted by Harris, R. Laird, et al. in Theological Wordbook of the Old Testament, vol. II, p. 694. Hasel, Gerard F.; The “Days” of Creation in Genesis 1: Literal “Days” or Figurative “Periods/epochs” of Time? (Andrews University, Berrien Springs, MI), p. 17. Stambaugh, James; The days of Creation: A semantic approach (Evangelical Theological Society papers, ETS-0152, 1996), pp. 3-4, 10, 12. Gentry, Kenneth L, Jr.; Ordained Servant, “In the Space of Six Days” (extract), vol. 9, no. 1 (January 2000), pp. 12-16. Fowler, Franklin S., Jr., M.D. ; The Scripture’s Most Important “Time” Prophecies (Christian Heritage Foundation, 2010). Theological Wordbook of the Old Testament, vol II, p. 2459b. Keil and Delitzsch, Commentary of the Old Testament, vol. 9, p. 691. Hasel, Gerard F.; op. cit., p. 440., quoting L. Kohler, Old Testament Theology (Philadelphia, 1957), p. 170. Harris, R. Laird; Theological Wordbook of the Old Testament, vol II, p. 1846a. W. Ramsay, The Letters to the Seven Churches (New York: Hodder & Stoughton, 1909), p. 115 as quoted in http://readingacts.com/2010/04/02/the-roman-cult-of-emperor-worship/. White, Ellen G.; Christian Service, 155; Manuscript Releases, vol. 10, p. 239. Pope John Paul II, Apostolic Letter, Dies Domini, On Keeping The Lord's Day Holy. Pope Benedict XVI. Encyclical Caritas in Veritate, Charity in Truth. White, Ellen G.; The Great Controversy, pp. 590-592; Maranatha, p. 188. White, Ellen G.; Manuscript Releases, p. 173, 1902; The Seventh-day Adventist Bible Commentary, p. 1161. White, Ellen G.; Counsels for the Church, p. 338. Fowler, Franklin S; When “The” Church Rides the Beast (Christian Heritage Foundation).